About six months ago I made a conscious decision to stop worrying about updating Postcard Valet. This was after a few months spent worrying about why I wasn’t updating the site during our last few months in Australia. Though I regret not explaining why I haven’t been updating, the rationalization for why was an easy one to make. Once we got on the road again, at the end of the day I barely had the time and energy to back up our photos and keep up with my daily journaling… Writing for the blog – let alone video editing – would have completely exhausted me, as well as taken away valuable travel time. This video, of course, continues where our first Salar de Uyuni video left off. With everything I’ve got on my to-do list while we’re living in Australia, I haven’t had as much time as I’d like for editing more travel videos. The biggest hurdle has been recording new voice-overs. Oksana is usually off working for 40+ hours a week, so there’s not much time for us to collaborate on the next big show-and-tell. I realized, however, that I had a set of voice-overs still on my hard drive — the ones we recorded last year during our Bolivian salt flat tour. ‘Bout time I followed up with the second part of that fantastic tour…! It wasn’t until I started editing that I realized how little footage I shot during day two and day three of that tour. Lots of great photos, very little video. I suspect it was because we didn’t have a reliable power source until the tour was over and I was worried about draining my batteries. Made the edit a little harder to pull off, but thankfully, I was able to supplement it with extra photos (as well as some of Wendy and Dusty’s videos.) I trust the beauty of the landscape still comes through. We spent four days on safari, driving through the Kruger National Park in South Africa. Our guides drove us around for hours each day as Oksana and I hung out our respective windows, searching the countryside for the next amazing animal. Before we arrived in South Africa, I never would have guessed that so many of the iconic African animals could be spotted in a single country. For some reason, I thought you had to travel all over the continent if you wanted to see lions, wildebeest, rhinos, giraffes, leopards, hyenas, elephants, crocodiles, zebra, buffalo, baboons, and warthogs. (We saw most of those the first day in the park.) About the only big African animal I can think of that we didn’t have a chance of seeing was a mountain gorilla. The highlight of the safari, for me, was spotting a cheetah. After we stopped the car to watch him, his brother also emerged from the brush. Both of those beautiful animals eventually crossed the road directly in us before disappearing into a ravine. The next day, it got even better. Oksana spotted another cheetah. Our guides were blown away. Not only are cheetahs among the rarest animals seen in the park, but we were the ones to spot them – not them, the more experienced guides! 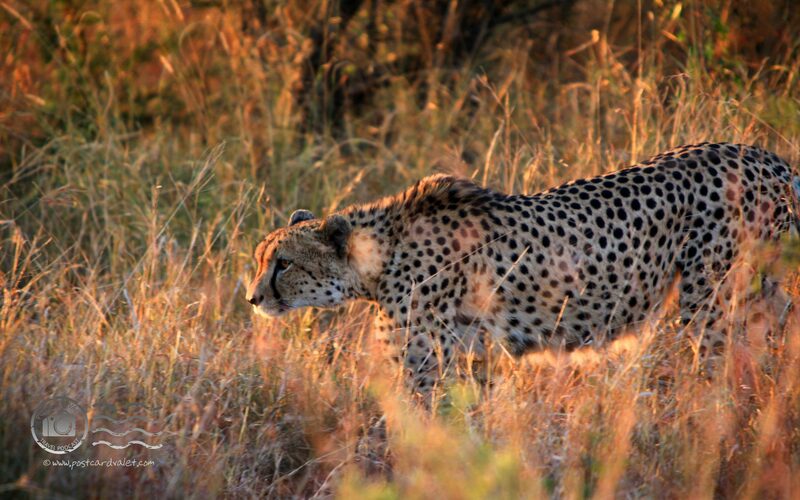 It was nearly sunset when we spotted the cheetah on the second day and we were far from our camp. Still, it was such an amazing animal, our guides graciously allowed us to stay as long as possible. As we watched, the cheetah got up and stretched, then went about marking his territory. Against all odds, his path again took him across the road we were on. This might not make much sense if you haven’t already read parts 1 and 2. Well… part 2, at least. It occurred to me at the time – I actually had the thought – that the situation we were in reminded me of one of those crazy African travel blog entries I’d read online. Dropped off in the middle of nowhere, not really knowing where we were, where we were going, or how we were going to get there. I had the sense that we were in the middle of a great story, but at the time all I wanted to know was how it was going to end. A large man in a military uniform was the last person to step off the bus. Because he stopped to purchase something from the roadside stand, he was soon the only other passenger still around. As he passed by us on the way down the road, Oksana asked if he knew where the river was. He gestured across the countryside, “I’m not sure,” he said. “But I think it’s three or four kilometers that way.” His accent was thick, but perfectly understandable. Both Oksana and I looked the way he indicated. It looked no different than any other direction. “I would wave at the first car you see,” he replied. Oksana and I looked up and down the dirt road. There were no cars. This is a continuation of the story told in the previous blog entry: Learning to use the bus rank in Botswana. We spent a week in Maun, passing most of our time in a chalet at the Okavango River Lodge. The lodge itself was nothing special, but it suited us just fine. This far from the actual river, we expected the delta to be mostly dried up, but Maun was seeing the highest water levels in 15 years. Our chalet was a two-room cement bunker set back in the landscaped grounds. It was quiet, but not so far from the open-air bar and restaurant on the water’s edge that we couldn’t hear the more social travelers watching the hippos grazing at sunset. Our room was a concrete box with a curtain hanging over a doorway into a small bathroom. I set up my laptop on a narrow desk and claimed the only chair in the room. Oksana spent a lot of time reading in bed, underneath the mosquito net. After dark I joined her there. That close to the river, the mosquitoes began to swarm just after sunset. We learned to shake out our clothing and shoes in the morning, too. There was a gap under the door that let in all manner of little crawly things. We didn’t see much of the delta while in Maun because we were caught between jobs. I spent most of the week diligently editing a video of our four-day safari with African Big 5 Safaris. They had treated us to a fantastic time and I was set on giving them the best promotional video I could manage. In the meantime, Oksana was coordinating our next assignment. There was a tour operator up near the Okavango Panhandle that had expressed an interest in taking us out on their riverboat in exchange for some professional photos of their renovations. Problem was, we didn’t have internet access. There was a laptop at the bar we could use to check our email, but at $6 per hour, it was actually cheaper for both of us to drive into town and get online at an internet café. We fell into a routine where we’d catch a combi to the city center every other day, buy some donuts for breakfast and check our email at a place called “Tech Times.” We’d load up on groceries before heading back out to the River Lodge – it was cheaper to eat PBJs and soup than to buy all our meals from the restaurant. Eventually, I finished the safari video and, because it was impossible to upload it to Youtube with Botswana’s poor internet infrastructure, we planned one more trip into town to mail a DVD back to our friends in South Africa. Oksana checked her email and discovered that our riverboat contact had just arrived in Maun the day before! We’d already made plans to ride out on a bus the following day, but she was offering us a ride instead. We were kicking ourselves for not checking our email the day before and for not going to the effort to get a cell phone while we were in Botswana. If we’d done either, getting in touch with them would have been easy. As it was, all we could do was reply to her email and hope they got in touch with us through the Okavango River Lodge. Just in case, I printed off all the contact information and directions to the riverboat from their website. I wanted to write a story about what it was like to ride a bus cross-country in Africa. I have two such stories that took place in Botswana, each interesting for different reasons. This is the first. If some of it sounds familiar, it’s because I wrote briefly about this ride in my Thoughts on Botswana post. South Africa was a good introduction to the continent for us. While still very different from what we were used to in South America, it wasn’t so strange that we had trouble getting around. We traveled around there for a month before moving on. On our last few days in Pretoria, Oksana met a couple Canadian college students in the shared kitchen of our hostel. They were volunteering in Gaborone, the capital of Botswana, and had come down for the weekend to check out South Africa. 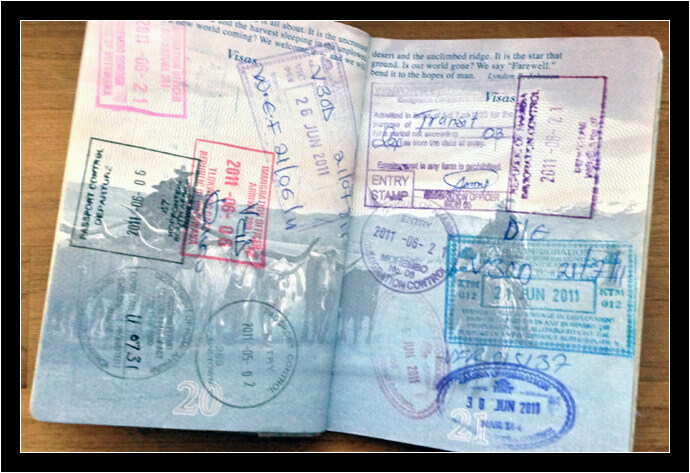 Oksana mentioned Botswana was next on our list and before we knew it, we had invitations to stay with them. They departed ahead of us, but a few days later we hopped on a bus and joined them in Gabs. The South African bus company we selected to get us there was both professional and efficient. We made the 7-hour trip in surprising comfort. It wasn’t until we traveled inside Botswana that we found the African busses I expected…and feared. We spent just a couple days in the capital; our real plans for Botswana involved the Okavango Delta, further to the north. Our new friends worked during the day, so we spent our time sightseeing and seeking out a prescription for anti-malarial medication. In the evenings, we reconvened for dinner back at the dormitory house. On our last day in Gaborone, we followed directions to the bus rank, to see about getting tickets to Maun. Even after an explanation of what to expect, we were not prepared for what we found.